Oh my goodness, this was simply fantastic! We almost ate all of it directly off the grill! The girls smelled it cooking and came running, too. I intended this to be a side dish along-side some grilled chicken, but obviously it would be a great appetizer as well. Asparagus is at its best in Springtime and these spears were incredibly fresh. The prosciutto was sliced a tad too thick at the deli so it didn't wrap quite as tightly around the asparagus as I would've liked, but the taste wasn't affected one bit! I made a balsamic vinaigrette to drizzle on top, but you could use a bottled dressing, as well. Yummy! Drizzle asparagus with olive oil and sprinkle with salt and pepper. 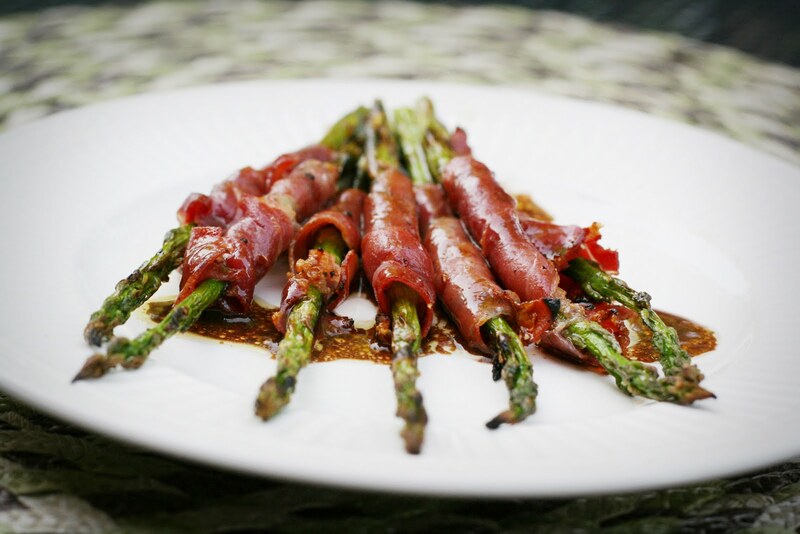 Wrap each spear tightly with one slice of prosciutto. For the dressing whisk garlic, balsamic vinegar, dijon mustard, salt and pepper together in a bowl. Slowly whisk in oil. Grill asparagus over direct heat until prosciutto is crisp. Be careful not to over cook the asparagus, as it tends to get mushy! Place spears on a plate and drizzle with vinaigrette. Serve hot! When you made this again, for us, with the thin prosciutto - I thought I was back in Italy! Awesome!